This adventure story has an historical setting, in France, in the age of mansions and aristocrats and servants and horses-and-carts. It is set in a time before the age of flight, when the notion of soaring above the clouds was barely conceivable. A few wealthy adventurers are experimenting with hot air, cotton and paper (with sometimes terrifying results!) and are desperate to defeat English competitors in the race to the skies. Into this scene, tumbles (rather unwittingly) a young, impoverished thief called Magpie. She is a worthy hero for any adventure story: fearless, fun, funny and accompanied throughout by an extremely sleepy rooster. Magpie enters the household of the aeronautical family, the Montgolfiers, under commission to steal secrets. Rather than the quick employment opportunity she predicts, it becomes an introduction to adventure. Magpie meets the young Pierre Montgolfier, and his pet duck, and the young pair soon realise that Pierre’s father will not be able to succeed in his quest for flight without their help. The pair have an enjoyable chemistry and spur each other on to find solutions that will help get their inventions into the air; not even Madame Montgolfier’s undergarments are safe from scientific experiments! Magpie faces a dilemma, as her life as a thief struggles to give way to her desire to be part of history. It is her friendship with the plucky Pierre and the trust she receives from him, that helps her make the right choices. Their plans draw the attention spies and thieves and even the French king, and their journey, which began in a field clinging desperately to ropes, eventually takes the friends all the way to the royal palace at Versailles. Pierre and Magpie’s journey is described with a pace and energy that will ignite young imaginations, but the tale also includes many interesting references to the history of flight, as well as intriguing twists and surprises that are well concealed. 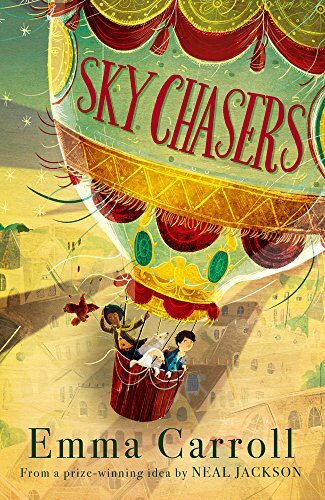 Some of the characters, particularly the villains, are somewhat underdeveloped, resulting in a lack of tension or suspense in places, but a feeling of awe and wonder is maintained throughout, and readers will share the balloonists’ sensation of being swept along into the unknown.